John Davies (1833-1897) was superintendent at Howell & Saxtan Iron Foundry until their demise in the early 1890s. Then from 1894 to 1897 he had his own foundry at 2nd Ave. and 11th St., Brooklyn. His life is summarized neatly in his obituary notice in the New York Times, 18 Sep. 1897, p. 7: "John Davies died of heart failure on Thursday at his home, 307 Fourteen Street, Brooklyn. He was sixty-four years old. Mr. Davies was born in the village of Clydach, Wales, and came to America at the age of seventeen. In 1861 the foundry of Howell & Saxtan, in Brooklyn, was established, and Mr. Davies became its Superintendent. 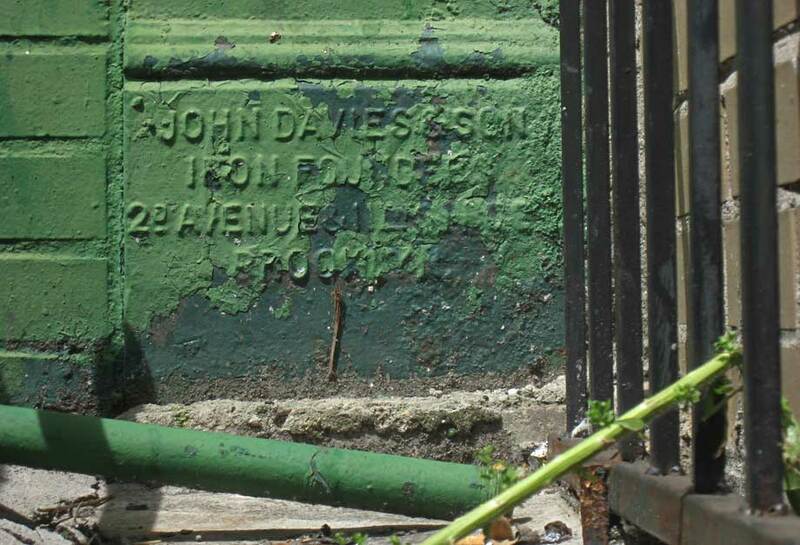 When, after thirty years this firm was dissolved, Mr. Davies built a foundry and established a business with his son, John I. Davies, in South Brooklyn." The John Davies foundry continued under Davies' son, John I. Davies (1871-1926), into the early 1900s. The history of Howell & Saxtan can be found at howell.htm.